It is fast acting and clamps up and releases with a quarter turn of the handle. It is hard to tell how it works from the photos. When the handle is turned it rotates a wedge shaped piece on the small bar that mates with a second piece that both the large and small bars goes through. 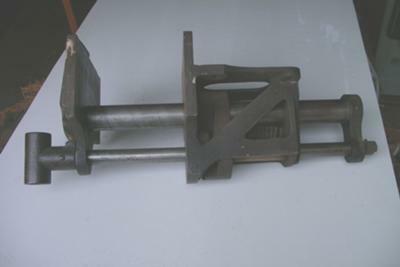 This wedging action causes the larger piece to cant and move ever so slightly to the rear of the vice thus pulling the front jaw tight against the work and locking it. Does anybody know the manufacturer?